Author Sarah Braunstein teaches second-, third- and fourth-graders at the East End Community School the keys to creative writing during the morning activity Power Pens on Friday in Portland. 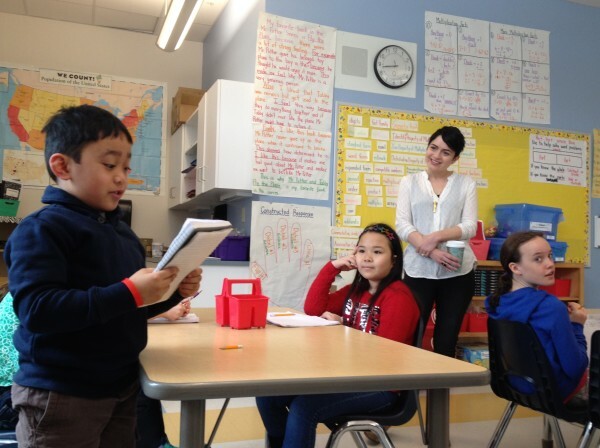 Antonio Hernandez (left), a second-grader at the East End Community School, reads his story as Sarah Braunstein (second from right) looks on during the morning activity Power Pens on Friday in Portland. 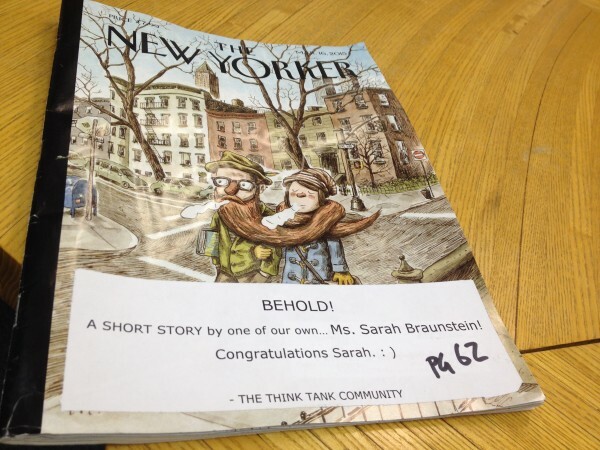 The New Yorker magazine featuring Portland author Sarah Braunstein's short story was seen on the table on Thursday at the Think Tank Coworking in Portland. Sarah Braunstein, who works out of the Think Thank Coworking in Portland, poses for a photo on Thursday in Portland. The author has a short story featured in a recent The New Yorker. For the next 45 minutes, the author and short-story writer challenged second-, third- and fourth-graders to ponder the quote while writing. She also sat down three objects on a chair to prompt the budding scribes. Once a week, Braunstein, 38, teaches a creative writing class called Power Pens. She developed the class to awaken children to the rewards of wordplay. Power Pens is part of the school’s Rise and Shine program, which invites parents to volunteer their skills, from engineering to wellness, for the morning elective. “We tapped into her talents,” said Marcia Gendron, the school’s principal. 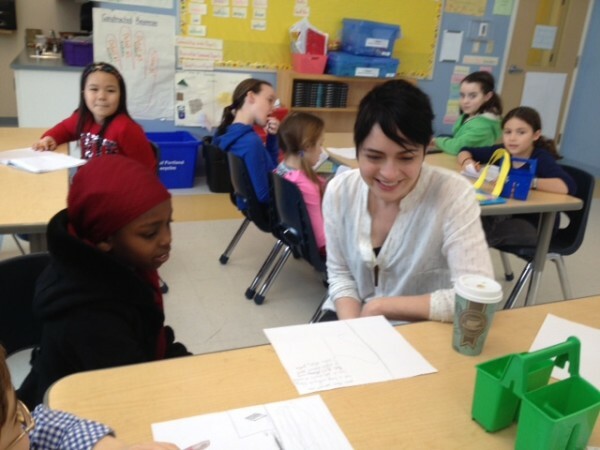 “She brings the author’s craft into the classroom,” which does more than increase literacy. It forms an important bond. Braunstein has been teaching the class for two years to help enrich the environment in which her son goes to school. Next fall, Braunstein will be a faculty fellow in fiction at Colby College, and this month, her short story “All You Have to Do” was published in The New Yorker. These public school students are learning from a real pro. The author of “The Sweet Relief of Missing Children,” winner of the 2012 Maine Literary Award for fiction, said she was “dizzy with happiness” when she learned the storied magazine wanted to publish her fiction for the second time in two years. “ All You Have to Do,” about a 16-year-old boy coming of age in the early 1970s and who wins an aluminum foil contest, is front and center on page 62 of the March 16 edition. Placing work in the iconic magazine is a triumph. While E.B. White of Brooklin was a regular contributor, submissions from J.D. Salinger were rejected for years before he finally broke in with “ Slight Rebellion off Madison” in 1946. When her first story, “ Marjorie Lemke,” came out in The New Yorker in April 2013, the Maine Writers and Publishers Alliance threw her a reception at Mayo Street Arts in Portland. Between grading papers of undergraduates at Bowdoin College and graduate students at the University of Southern Maine, where she teaches fiction and creative writing, Braunstein always has a short story cooking. “I think miraculous things happen all the time. Usually they become a dinner party anecdote or nothing at all. My job is to turn it into something deeper, fuller,” said the big-eyed sprite with close-cropped hair and a rapid rhythm. The Connecticut native moved to Maine in 2007. It was amid the state’s natural beauty and buzz of Portland where her first novel, which was an O, The Oprah Magazine pick, took shape. What kept her going? A place to showcase her work. “I went into Longfellow Books and met the owners, Stuart Gersen and his partner Chris Bowe, stewards of this community. I wanted my book in that window. I wanted to make them proud,” said Braunstein, whose book is on the shelves, and, this week, whose autographed copies of The New Yorker are for sale. 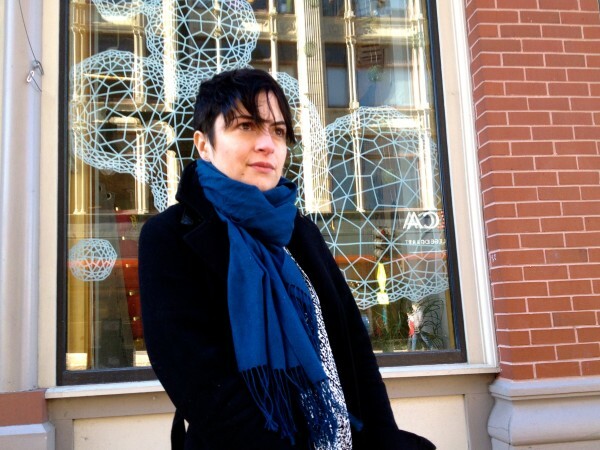 Her next novel, which she expects to complete during the summer, is set in Portland. No release date is set for the as-yet untitled work. Being welcomed into Maine’s vibrant writing community was seamless. Before Portland, she lived in Iowa, New York and Oregon, but it was in the Port City where her writing life caught fire. “I came ready to write to a place that seemed ready to receive writers,” said Braunstein. The tankers merging with pleasure boats, the industrial ebb and flow of the working waterfront, speaks to her. Amid the lively literary community, she’s found fellowship. “I don’t feel competition here. There is goodwill in Maine amongst the writers. It’s a smaller community; you can get attention which in New York City might be harder to receive,” she said. Joshua Bodwell, executive director of the Maine Writers and Publishers Alliance, said Braunstein is the next generation of scribe making a name and life for themselves in Maine. When Braunstein isn’t working on her own prose, she is helping to inspire others in their craft. From serious grad students, to pint-sized pencil holders, she is stimulating imagination. And she offers them a tool to help process their busy, young lives. Walking out of the school and into the biting March air, the feeling is mutual for Braunstein.